Considering very simple diffusion rules between nodes, one can test wether various topology impact or not on diffusion dynamics. Let’s consider an asynchronous mouth-to-mouth spreading : at each time step, a random agent is interacting with one of her/his neighbor randomly chosen. Two transmissions directions can be considered : the agent (i) tries to diffuse/get an information to/from this neighbor (j). If one of the agent was formerly acquainted with the information and if her/his neighbor was not, a transmission happens. 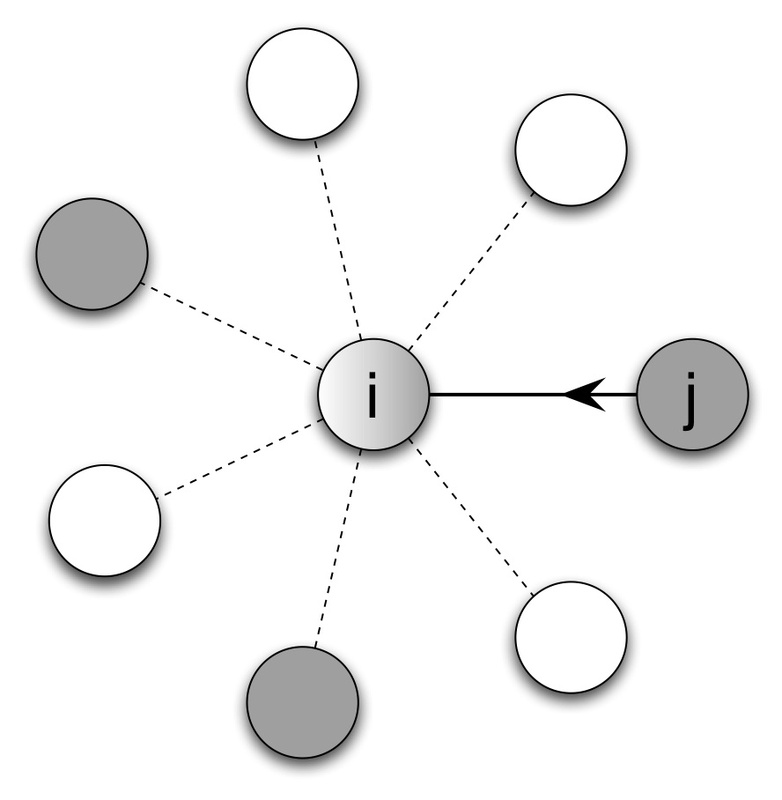 Simulating this transmission mechanism, we observe that the network topology deeply impacts the diffusion speed of the information over the network. diffusion on real-word network is much slower than one could expect from a random network with the same number of node and links. More, the degree distribution of the network does not change anything to the diffusion speed. In fact, local density seems to account for this speed reduction. In a very clustered network, diffusing information seems to be easily trapped, the network topology is creating homogeneous areas within which most interactions are redundant. Degree distribution seems to have negligible consequences on the diffusion process because every agents have the “same activity”: whatever the sense of the transmission, with this asynchronous modelling, a high-degree agent is either a frequent receiver of information or a frequent transmitter but nether both. Thus the global dynamics remains pretty much unchanged when compared with a random degree distribution network which is significantly different compared to the classical case (SI for example) where at each time step, agents are trying to diffuse information to every of their neighbors. In this case, heterogeneity of degree indeed impacts on the diffusion dynamics because agents with higher-degree are indeed involved in more interactions both as transmitters and receivers.